This Savage realm of Suzerain is the tale of the 1930s Great Depression as you've never experienced it. 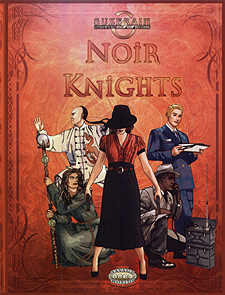 For Heroic rank characters who are feeling particularly heroic, Noir Knights is part of our American Grit realm, where government agents investigate paranormal activity across a hard boiled film noir America. Whether it's a supernatural swampland encounter in Florida or otherworldly conspiracies in the corridors of power, the truth is out there - just waiting for your characters to find it. Industry and legend clash in a time of folk heroes, hobo mages, and secret societies. America is a nation of dust and determination. Ride the rails and prove your mettle. Inside the covers of this book you'll find what you need to run games in a supernatural 1930s. Many new character options include new Edges, Hindrances and Powers, weather-manipulating wizards, taxidermist re-animator priests, and hobo railwalker magic users - all as playable options! All inspired by the X-files with femmes fatales and four-colour G-men thrown in.